n the late hours of 30th December 1978, an Argosy freight plane left Wellington, New Zealand - the pilot was Captain Bill Startup, a very experienced flyer and the co-pilot was Bob Guard. The air crew were accompanied by an Australian T.V. unit from Channel 0-10 Network. The purpose of the flight was to try to capture a UFO on film - for some weeks UFOs had been sighted over Cook Strait. When the aircraft was flying over the Pacific Ocean, to the northeast of South Island, the pilots observed a strange object in the sky; they endeavoured to verify their sighting with radar confirmation at Wellington air traffic control. Quentin Fogarty, T.V. reporter, stated that he saw a row of five bright lights which were pulsating and grew from the size of a pinpoint to that of a large balloon. The whole sequence was then repeated, the lights now appearing over the town of Kaikoura, between the aircraft and the ground. "Sierra Alpha Eagle, you have a target in formation with you…… target has increased in size". At this, the crew and passengers saw lights outside of the aircraft but were unable to film them because of interference by the plane's navigation lights. 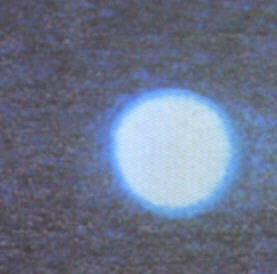 When the navigation lights were turned off, however, everyone aboard the aircraft saw a big, bright light which Crockett was able to capture on his "hand-held" camera. In order to do this Crockett had to exchange seats with Bob Guard, causing the resultant filming to suffer from the effects of camera shake. However, he managed to obtain 30 seconds of decent footage. The resultant film taken during these two flights was shown all over the world - the BBC giving it priority on the main evening news programme. Despite the fact that the filmed events were also evident on ground based radar, sceptics were driven to extreme and strange lengths to explain the filmed evidence, including the lights from shrimp boats, top secret U.S. remote controlled planes etc, etc., etc…..It should be noted that the Royal New Zealand Air Force was so concerned about the event that Skyhawk jet fighters had been put on full alert in order to intercept the UFOs. "The scientist who suggested that all (on the aircraft) were seeing Venus on a particularly bright night can be safely consigned to Bedlam (insane asylum)! !